Jurgen Klopp claims that he isn’t able to make the type of signings that every Liverpool fan wants to see, insisting that if we’re expecting big name signings then we’re set to be disappointed, as reported by the Echo. There’s been a lot of talk about the calibre of our signings in recent years, with some sections of the fan base frustrated that we aren’t bringing in some bigger names. 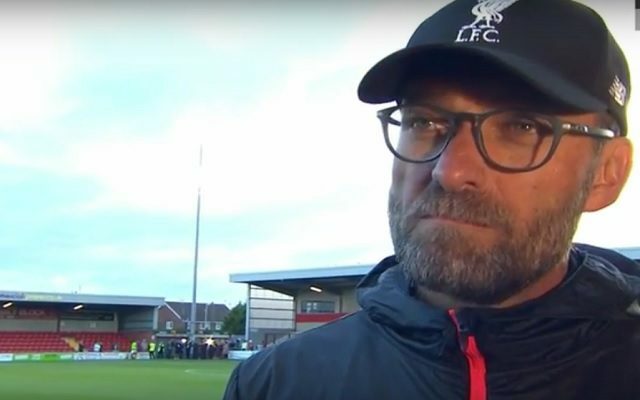 Klopp admitted that we aren’t necessarily able to compete in the transfer market with some of the other clubs, but stressed that big names didn’t automatically mean big success. “I cannot make the transfers everyone wants,” he said. “This period in every year is one of a lot of expectations. “Some clubs have already done a lot but you cannot prove in this moment what’s really right. What you have to do is prepare the new season. “At the moment nobody thinks about the good games we played last season or the bad games. While we’ve barely even scratched the surface of our pre-season campaign, the signings Klopp has already made look excellent. They seem perfectly suited to his style of play, and he’s done it all without breaking the bank – with the exception of Sadio Mane. The majority of Liverpool fans will appreciate the work he’s done so far in the transfer window, knowing that he’s building a team for the future that is capable of challenging the biggest teams in the world for the biggest trophies. Those who are calling for bigger names and marquee signings should know that they obviously aren’t alone in their desires to see top quality players arrive at Anfield, but also need to know that being realistic is important. We need to accept that sometimes we will lose out to Manchester United or Manchester City financially, sometimes players will choose Chelsea or Arsenal because they want to live in London, and until we reclaim regular Champions League football that will always be a factor. We’ve seen the quality of player Klopp is able to attract though, and there’s a real sense of excitement going forward. We’re certainly not disappointed with Klopp or his transfer activity so far. Are you?